July 9, 2010 marks a year since Rokiah’s passing. While it may be convenient to say that words cannot express the feelings, this will not be the case this time. 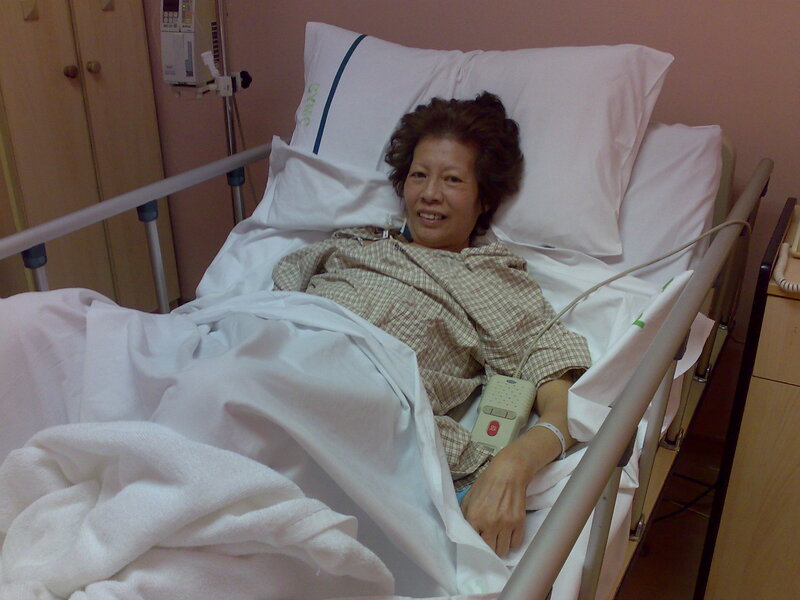 One year is enough time to make an unemotional review of the loss that occurred at 11.20pm, July 9, 2009 in a quiet ward at a specialist hospital in Johor Bahru. The surgeon who first operated on Rokiah on September 5, 2008, to remove the primary tumor did not do a good job. Hardly six days after this first major operation, the wound started to discharge liquids. This only meant one thing – the wound is not healing, and necessitated a second major operation on September 20. That’s two major operations only two weeks apart. Can any person stricken with 4th stage cancer bounce back from this? This particular doctor, operating (no pun intended) at Sunway Medical, came highly recommended. As far as colon cancer was concerned, he was considered one of the best in the country. I had suspected for a long time that his skills were not quite up to the mark after the first operation, and now, given enough time to ponder the possibilities, I come to the conclusion that this surgeon botched the operation. Cases of the wound not healing and necessitating a second operation so soon after the first in colon surgeries such as this one is rare, and can even be considered unusual. Add to this was the fact that in the months to follow, a swelling developed in the same area where the original tumor was, a swelling that keep recurring until Rokiah’s death. It was this swelling, when it broke and pus/fluids/blood discharged, that sent Rokiah in an ambulance to the hospital for the very last time. I had the opportunity to speak to the Medical Director/Surgeon in the Johor hospital during her admission there and he mentioned something that made sense of what I had been thinking all along. This kind, compassionate head of the hospital said that the recurring swelling (it would form, break open, then form again) is likely a result of some bacteria left in the colon area that was not completely cleaned up during the first operation. Now wouldn’t this be a case of a poorly handled surgery by a not so competent surgeon? Lesson learnt: Always seek a second, even third opinion. When diagnosing a disease or when choosing a doctor. I was there throughout Rokiah’s sickness, to witness the suffering and the decline in her health over 12 months. And because of this, a fear of cancer now exists in my mind. Sometimes, when I get a prolonged cough, I half expect to see some blood the next time I cough. And every time I get a discomfort or pain somewhere in my body, I will recall, painfully, what it must have been like to be ill for so long. To have to endure this evil sickness with the thought that the battle against this deadly foe may be a losing one cannot be easy for anyone. I also realize that no matter how much we empathize, we will never know what its really like to suffer from cancer. If there is a blessing from this, it is the awareness of how important good health is. Health being wealth has new meaning for me. Just being able to sit down and eat a meal is a blessing from God as there are many who cannot eat, let alone enjoy a meal. And good health comes from eating right. I have completely changed my diet, while still staying on the side of sanity, of course. No, I am not a vegan, and no, I do not believe in eating only organic food. But anything that now goes into my mouth has to mentally pass a ‘healthy food check.’ Added to this is a little exercise, exposure to sunlight, one or more ayurvedic practices and avoidance of quite a few goodies. There will be no turning back for me and I urge you to do the same. Lesson learnt: Appreciate the key role food plays in helping the immune system maintain good health. Perhaps the most telling lesson for me as far as cancer is concerned is that conventional cancer treatment does not help a cancer patient, especially a patient with advanced cancer. More often than not, it actually speeds up the demise of the patient, and along the way, inflicts more damage and suffering on the patient. I have also learnt that doctors dealing with cancer see things from only one side, the side that can only offer radiation and chemotherapy as ‘cures.’ They are simply ignorant on other ways and methods to treat the disease. And that the majority of doctors know next to nothing about nutrition and healthy eating. You shouldn’t be surprised actually, because they do not teach doctors nutrition in the majority of medical schools. I would go as far as to say that the more I read about cancer, the less respect I have for doctors, surgeons and most of all, oncologists. When will they ever see the light? Lesson learnt: There are other ways to treat cancer. Doctors are not that smart. You may be smarter. With email being so common today, you may have received one of those emails that tell you to appreciate what you have now, or to smell the roses, or to express your feelings to those close to you before its too late. It is true and we should take heed. Rokiah showed great strength, courage and grace during her time of suffering. I never once heard her complain about her cancer. And she always had a smile on her face, in the face of adversity. She will always be loved, and missed.